Background: Cupping is an ancient traditional therapeutic technique, used mainly for the treatment of chronic pain and also for an array of respiratory, neurological, gastroenterological and gynaecological disorders, particularly in oriental countries. However, its mechanism of efficacy is still obscure. The present study was designed to evaluate the clinical effect of cupping therapy on some dermatoses and to figure out its probable mechanism of action. Methods: Fifty patients [12chronicidiopathicurticaria(CIU),9atopicdermatitis,11acnevulgaris,10vitiligoand8psoriasisvulgaris] were treated by "wet cupping technique". IgE, C3 and IL-2 levels were measured in serum samples collected from the patients before and after ending the cupping therapy. Results: Clinical improvement has been noticed in 24 out of the 50 patients (12 CIU, 10 acne vulgaris and 2 atopic dermatitis patients), while all vitiligo and psoriasis patients did not show any improvement. After cupping therapy, serum IgE and IL-2 levels significantly decreased (p=0.006, p=0.001 respectively), while serum C3 level significantly increased (p=0.02) in those 24 patients. Conclusions: Chinese wet cupping can be considered an effective alternative or complementary therapy for CIU and acne vulgaris patients. The change in serum IgE, IL-2 and C3 levels after cupping therapy, in improved patients, may suggest that cupping therapy performs its action through correcting abnormalities in the immune system. Cupping is an ancient traditional therapeutic technique that has been practiced, for thousands of years and till now, particularly in East Asian countries . In Egypt and Arabic countries, cupping therapy is known as "Al-Hijama. Recently, the number of followers of this traditional medicine is increasing in the western world . This therapy involves the application of a suction cup to a localized area of the skin; this area is termed acupoint . Seven major types of cupping are practiced in China. The basic suction method of cupping therapy is called retained cupping, which is most commonly used in Chinese clinics as the first type of cupping. In this method practitioners utilize the flaming heating power to achieve suction (minus pressure) inside the cups to make them apply on the desired part of the body. The second type of cupping is bleeding cupping (wet cupping), in which practitioners make some small incisions before applying the suction cups. Besides, there are different types of cupping applied with different methods. Each kind of cupping therapy may be used for different diseases or different purposes of treatment . Although its exact mechanism of efficacy remains obscure, cupping is mainly prescribed as a treatment for chronic pain. It is also indicated for an array of respiratory, neurological, gastroenterological and gynecological disorders . In the field of dermatology, cupping has been used, with varying degree of success, for the treatment of skin diseases as cutaneous infections , urticaria , acne vulgaris  and chloasma . Nowadays, as the use of alternative therapies is on the rise, the use of cupping may undoubtedly become more common . The present study aims to evaluate the clinical efficacy of cupping therapy in some dermatoses and to figure out its probable mechanism of action. females, age range 11-50 years with a mean and SD of 27.7±11.4). range 11-34 years with a mean and SD of 22.4±8.8). with a mean and SD of 21±3.9). 40 years with a mean and SD of 27.6±10.5). with a mean and SD of 39±18.5). Patients with CIU were diagnosed by the occurrence of daily, or almost daily, wheals and itching for at least 6 weeks with no apparent cause . In patients with atopic dermatitis and psoriasis vulgaris, diagnosis was proved by a lesional skin biopsy. Patients were instructed to stop any treatment at least 4 weeks before starting cupping therapy as well as throughout the therapy sessions. Patients with bleeding tendency, severe anemia, diabetes, renal or hepatic failure, hepatitis B or C positive patients and pregnant women were excluded. Also, patients aged below 10 or above 70 years old were excluded. A cupping set was used in cupping therapy composed of disposable plastic cups and a hand-held manual pump (Beijing Kangzhu Baguanoi; Add. : 23 Jinyuchi West St. of Chongwen District, Beijing, China; Patent no. : ZL 95200265.5). Point (1): on the 7th cervical vertebra. Point (55): below point 1 by about 3 cm. Point (49): on the 5th thoracic vertebra. Point (6): at the lower end of the vertebral border of the scapula on the right side. Points (7 &8): on both sides of the vertebral column at the level of T11 vertebra. Point (11): on the 5th lumbar vertebra. With the patient in the prone position, to avoid faintness, the back was cleaned with povidone iodine solution. Each cup was lined by a condom to avoid soiling the cup. The cups were then applied on the selected points on the skin and a negative pressure was created inside them using the manual pump. This caused suction of the skin inside the cups, which was maintained for 3-5 minutes. Then, the cups were released by pulling the cup's valve leaving a circular congested area on the skin to mark the site of the cup. By a surgical blade, 10-15 shallow incisions, about 3-4 mm long and less than 0.1 mm deep, were made at the site of only 4 cups at points 1, 55, 7 and 8. These incisions were parallel to the body plans. The remaining points; 6, 49 and 11, were not incised . A piece of cotton was put inside the cup, and then the cup was applied again to the skin at the same site. With suction, bleeding from the incisions collected inside the condom lining the cup and absorbed by cotton without touching the cup itself. The cups were left for 2-5 minutes, and then removed. The skin was cleaned and the incisions were covered by dressings. Condoms containing blood-soaked cotton were removed from the cups and disposed. Cups were then washed with soap and water and kept for the next session for the same patient. After ending therapy, these cups were disposed. Two blood samples were drawn from each patient. One before the 1st cupping session and the 2nd was taken 2 weeks after the last session. Part of the sample was used for complete blood cell count (CBC) and the other was centrifuged to gain serum for assessment of IgE, IL-2 and C3 levels. Serum total IgE and IL-2 levels were measured by the ELISA method with Immulite Analyser (Product no. : 030001-04, Serial no. : E0531B, Manufactured by Diagnostic Products Corporation DPC Inc., Los Angeles, CA, USA) using monoclonal mouse anti-IgE antibody (Immulite total IgE, Cat no. : LKIE5, Diagnostic Products Corporation DPC Inc., Los Angeles, CA, USA) and mouse monoclonal antibody against IL-2 (Quantikine Human IL-2 Immunoassay, Cat no. : D2050, R&D Systems Inc., Minneapolis, USA). IgE values were expressed as IU/ml and IL-2 as pg/ml. Serum C3 level was measured by the nephelometric method with automatic set (Hitachi 902, Boehringer Mann Heim, Part no. : 7130021, Serial no. : 1122-030, Hitachi Ltd., Tokyo, Japan) using human C3 antiserum (Minineph Human C3 Kit, Code no. : ZKO23.R, Minineph, The Binding Site Ltd., Birmingham, UK). C3 values were expressed as mg/dl. Data were statistically analyzed using SPSS (Statistical Package for the Social Sciences) version 8.0 (LEAD Technologies Inc., USA). Results were expressed as mean±SD (standard deviation). Statistical significance (p≤0.05) was assessed by Student's t-test. Patients of this group received 2-5 sessions. From these patients, 9 patients (75%) completely cured with disappearance of episodes over a period of 8 months follow-up after completion of sessions and 3 patients (25%) showed mild improvement in the form of lengthening of the intervals between episodes. The total efficacy rate was 100% (Fig. 1). Patients of this group received 3-5 sessions. Only 2 patients (22%) moderately improved while the remaining 7 patients (78%) did not manifest any improvement. Patients of this group received 3-6 sessions. Of these patients, 7 with nodulocystic acne (64%) showed excellent improvement with disappearance of most lesions. Of the remaining 4 patients with papulopustular acne, 3 patients (27%) moderately improved and one patient (9%) did not respond to the therapy. The total efficacy rate was 91% (Fig. 2). Patients of this group received 3-5 sessions. All patients in this group did not show any improvement in response to cupping therapy. Patients of this group received 1-4 sessions without showing any improvement. Moreover, Koebnerization occurred in 3 patients at the sites of the cups and incisions, so that the sessions were stopped immediately. Fig 1: a. A case of CIU during the 1st cupping session. b. Noticeable improvement of CIU lesions 3 days after the 1st session with ecchymoses at the sites of cups. 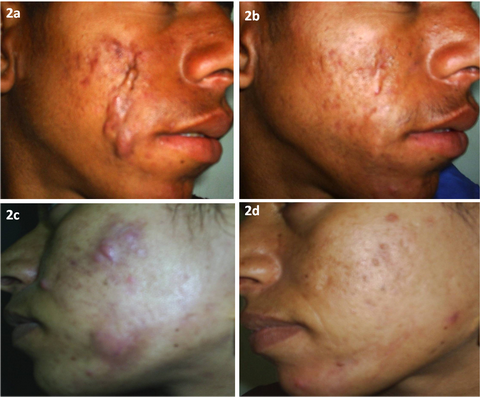 Fig 2: a. Nodulocystic acne in a male patient before cupping therapy. b. Excellent improvement after cupping therapy. c. Nodulocystic acne in a female patient before cupping therapy. d. Excellent improvement after cupping therapy. Common side effects were encountered as circular erythema and circular ecchymoses at the sites of the cups after treatment sessions which subsided before the following session. Complete blood cell count (CBC) of the 50 patients included in the study showed no significant differences, in the platelet or cell counts, after cupping therapy in comparison to those before therapy. In group I (CIU), serum IgE level significantly decreased after cupping (326.2±304.4) than before cupping (781.2±807.9) (p=0.04). Whereas, serum IL-2 and C3 levels showed no significant difference after cupping (22.4±4, 117.8±37.7 respectively) from that before cupping (25.4±4.8, 111.4±27.2) (p=0.1, 0.4) (Table 1). In group II (atopic dermatitis), there was no significant difference between serum IgE, IL-2 and C3 levels after cupping (985.3±737.1, 49.6±9.2, 119.1±28.4 respectively) and those before cupping (862±812.9, 50.9±8.9, 107.4±26.3) (p=0.6, 0.1, 0.3) (Table 1). In group III (acne vulgaris), serum IgE and IL-2 levels significantly decreased after cupping (741.4±651.7, 21.1±2.5 respectively) than before cupping (890.2±706.5, 25.4±3.6) (p=0.03, 0.003). Whereas, serum C3 level showed no significant difference after cupping (124.7±33.1) from that before cupping (105.9±18.2) (p=0.1) (Table 1). However, in excellently improved acne patients (7 out of 11 patients), serum C3 level significantly increased after cupping (136.3±34.2) than before cupping (99±15) (p=0.008). In group IV (vitiligo), there was no significant difference between serum IgE, IL-2 and C3 levels after cupping (370.8±544.5, 18.7±0.9, 134.5±3 respectively) and those before cupping (391.3±518.5, 19.1±1.8, 120.2±27.7) (p=0.6, 0.4, 0.2) (Table 1). In group V (psoriasis vulgaris), also, there was no significant difference between serum IgE, IL-2 and C3 levels after cupping (197.8±119.9, 35.2±6.6, 103.8±22.8 respectively) and those before cupping (242.9±229.6, 34.8±8.3, 98.5±41.2) (p=0.5, 0.8, 0.6) (Table 1). In the 50 patients included in this study, serum IgE level showed no significant difference after cupping (524.6±578.1) from that before cupping (655.7±692.3) (p=0.07). Whereas, serum IL-2 level significantly decreased after cupping (28.3±12.5) than before cupping (30.2±12.2) (p=0.002), and serum C3 level significantly increased after cupping (120.7±31.8) than before cupping (109.2±27.9) (p=0.01) (Table 1). On the other hand, in all improved patients in the studied groups (12 CIU, 10 acne vulgaris and 2 atopic dermatitis; 24 out of 50 patients), serum IgE and IL-2 levels significantly decreased after cupping (539.4±583.3, 23.9±8.5 respectively) than before cupping (856.5±768, 27.4±8.2) (p=0.006, 0.001). While serum C3 level significantly increased after cupping (125±35.8) than before cupping (109.2±22.8) (p=0.02) (Table 1). Table (1): Mean serum IgE, IL-2 and C3 levels before and after cupping therapy in the studied groups. There are only few studies in the literature evaluating cupping therapy in the treatment of skin diseases. Moreover, most of these studies are published in the Chinese language and the available abstracts in English do not allow enough information about the design of the studies and the exact cupping technique. In the present work, cupping therapy using the wet (blood-letting) technique has proved 100% total efficacy rate in the treatment of chronic idiopathic urticaria (CIU), 91% in acne vulgaris, especially nodulocystic type, and only 22% in atopic dermatitis. Cupping therapy has been used in the treatment of urticaria with varying degrees of success [5,10-11]. It has been reported to be effective in the treatment of acne vulgaris with efficacy rate of more than 90% [6,12-13]. Pan (2005)  reported the highest rate of efficacy of cupping therapy in the treatment of acne patients (96.8%) and this may be attributed to a Chinese-drug facemask he used together with cupping in the treatment of his patients. Wang  reported successful treatment of 87% of patients with eczema using wet cupping. However, he did not mention the type of eczema he treated. Meanwhile, the number of sessions in his study was 15 sessions, whereas, much less number of sessions (3-5) was followed in the present study. Vitiligo (10 patients) and psoriatic (8 patients) patients included in our study did not show any improvement with cupping therapy. Moreover, koebnerization was encountered in 3 psoriatic patients. On the contrary, Jun (1992)  reported improvement of 90% of vitiligo patients and Zhao et al. (1991)  reported improvement of 98.4% of psoriatic patients treated with cupping. However, they used other means to aid the therapeutic effect of cupping as herbal tincture  and acupuncture or electro-acupuncture  in addition to cupping. It is apparent that the efficacy rate of cupping therapy in published studies differs significantly from that reported in the present study because of the different applications of cupping therapy. In the present study, wet cupping only was used in the treatment of all patients and the maximum number of sessions was 6, with 2-4 weeks interval between sessions. Other authors used either wet or dry cupping, more or less number of treatment sessions, and added herbal preparations or other modalities besides cupping to increase its efficacy. However, the regimen of treatment designed in those reports depends mainly on the experience and does not depend on scientific terms or evidence based medicine. Usually, cupping therapy causes circular erythema, edema, ecchymoses or purpura that takes several days to several weeks to subside . Heated cups can result in circular burns , prolonged cupping period can result in suction bullae  and wet cupping probably increases the risk of infection . In one case, long-term wet cupping therapy was reported to cause cardiac hypertrophy due to chronic severe iron deficiency anemia . Weng and Hsiao (2008)  were the first to report a case of acquired hemophilia-A due to cupping therapy. In the present study, wet cupping was the technique adopted to treat all the patients included in the study. Despite that, secondary infection and cross infection were not encountered as strict antiseptic and anti-cross infection measures were considered. Povidone iodine solution was used to clean the skin before and after cupping, moreover, a condom was applied to each cup before treatment and was removed together with the blood- soaked cotton wool after treatment. A separate set of disposable plastic cups was used for each patient and disposed after ending the sessions. As plastic cups and a manual pump were used to apply the technique, burns were never encountered. However, ecchymoses were the only side effect observed, that usually subsided before the following session. It is strongly believed that various traditional therapies (also termed alternative or complementary medicine) function and heal through their influence on the immune system of the human body  so in the present study, beside the clinical evaluation of the efficacy of cupping therapy, laboratory investigations were performed. Complete blood cell count (CBC) and serum levels of IgE, IL-2 and C3 were measured in patients before and after cupping therapy to detect any changes that may be related to the therapy. In the 50 patients included in this study, there were no significant changes in the means of platelet or cell counts after cupping therapy. Also, serum IgE level showed no significant difference after cupping (p=0.07). Whereas, serum IL-2 level significantly decreased (p=0.002) and serum C3 level significantly increased (p=0.01) after cupping therapy. The pathophysiology of chronic urticaria is based on the cutaneous mast cell release of mediators, predominantly histamine. Release can be induced via specific IgE, components of complement activation and nonspecifically by various compounds including endogenous peptides, endorphins and enkephalins . One study reported that total IgE serum level becomes elevated in acute, chronic and physical urticaria . Another study found that serum C3 content in chronic urticaria patients is significantly lower than that in healthy adults . Also, increased levels of circulating pro-inflammatory cytokines such as TNF-alpha, IL-1 beta, IL-12p70 and IL-16 were observed in most patients with chronic idiopathic urticaria (CIU), together with an enhancement of IL-2 secretion following T-cell stimulation . In the present study, all CIU patients (group l, 12 patients) showed clinical improvement in response to cupping therapy. In those patients, serum IgE level significantly decreased after cupping therapy (p=0.04), while serum IL-2 and C3 levels showed no significant change (p= 0.1, 0.4 respectively) after cupping therapy. In atopic dermatitis (AD), serum IgE level was found to be significantly higher in patients than in healthy population and showed significant correlation with severity of the disease [27-28] whereas serum C3 level was reported to be lower in AD patients than in healthy subjects and correlated inversely with the disease severity . There is an inverse correlation between IL-2 concentration and the severity of AD or serum IgE level. On the contrary, serum IL-2 receptor (IL-2R) level was found to be significantly elevated in AD as compared with healthy subjects. Furthermore, IL-2R level in AD patients showed a significant correlation with IgE level and disease severity . In group II (9 atopic dermatitis patients), no significant differences were encountered in serum IgE (p=0.6), IL-2 (p=0.1) or C3 (p=0.3) levels after cupping therapy, where only 2 patients showed moderate clinical improvement. In acne vulgaris, C3 deposition around lesions is an early event in the inflammation of lesions . It is suggested that propionibacterium acnes can stimulate T-cell proliferation and IL-2 production  and increases interleukin mRNA expression levels in keratinocytes . In acne vulgaris patients (group III, 11 patients), we have found that serum IgE and IL-2 levels significantly decreased (p=0.03, 0.003 respectively) whereas, there was no significant change in serum C3 level (p=0.1) after cupping therapy. However, in acne patients who showed excellent improvement (7 out of 11 patients), serum C3 level significantly increased (p=0.008) after cupping therapy. It has been reported that C3 and C4 values were significantly higher in vitiligo patients than in normal subjects . Serum level of soluble IL-2R (sIL-2R) was significantly higher in vitiligo patients than in healthy subjects. Moreover, patients with short duration of the disease showed higher serum level sIL-2R . In the present study there was no significant change of serum IgE (p=0.6), IL-2 (p=0.4) or C3 (p=0.2) levels after cupping therapy in vitiligo patients (group IV, 10 patients). High serum IgE levels were detected in psoriasis vulgaris patients  and much higher levels were detected in psoriatic erythroderma patients . Elevated serum levels of C3a in psoriasis suggest that there is a continuous activation of the complement system leading to the generation of inflammatory mediators . One study found significantly higher serum IL-2 levels in patients with plaque-type psoriasis than in healthy subjects . In the present study, there was no significant change of serum IgE (p=0.5), IL-2 (p=0.8) or C3 (p=0.6) levels after cupping therapy in psoriatic patients (group V, 8 patients). Analysis of the data of the patients who showed clinical improvement only (24 out of 50 patients) revealed that serum IgE and IL-2 levels significantly decreased (p=0.006, 0.001 respectively), while serum C3 level significantly increased (p=0.02) in those patients after cupping therapy. These changes in serum IgE, IL-2 and C3 levels in clinically improved patients after treatment could be related to cupping therapy. This indicates that cupping therapy may exert its therapeutic effect through influencing the immune system of the patient. The other possibility is that these changes could be the result of disease improvement. Whether these immunological changes are the cause or the result, this issue remains to be clarified. It has been noticed that serum IgE level decreased after cupping therapy in all treated patients, except in atopic dermatitis patients. However, this decrease did not reach statistical significance, except in group I (CIU) and group III (acne vulgaris) where the decrease in serum IgE level after cupping therapy was significant (P≤0.05). Also, serum IL-2 level decreased, but, insignificantly, after cupping therapy in all treated groups, except in group III (acne vulgaris) where the decrease in serum IL-2 level was significant (p= 0.003). Another observation is that serum C3 level increased after cupping therapy in all treated groups, but this increase did not reach statistical significance in any group. This may suggest that cupping therapy influences the immune system regardless the clinical response to the therapy. On the other hand, statistically significant increase in serum C3 level (P≤0.05) was encountered in all improved patients of the studied groups (24 out of 50 patients), as well as in acne vulgaris patients who showed excellent improvement (7 out of 11 patients) after cupping therapy. From the present results, it can be concluded that wet cupping is an effective alternative or complementary therapy for CIU, acne vulgaris (especially nodulocystic type) and only some cases of atopic dermatitis. Decreased serum IgE and IL-2 levels and increased serum C3 level in those patients after cupping therapy, may suggest that the beneficial effect of cupping therapy could be attributed to correcting abnormalities in the immune system. On the other hand, the results also advice not to perform wet cupping therapy for vitiligo or psoriatic patients. After all, the results of this study and other studies in the literature indicate that cupping therapy, despite its efficacy in treating some diseases, is a mysterious therapy that depends on individual experience and does not depend on scientific terms. More scientifically evidence based controlled studies are required to figure out its exact mode of action, definite method of application, diseases that can benefit from such therapy and its remote effects on the human body. 1. Xue CC, O'Brien KA. Modalities of Chinese Medicine. In: PC Leung, CC Xue, YC Cheng (eds.) A Comprehensive Guide to Chinese Medicine. Singapore; World Scientific, 2003: 19-46. 2. Mataix J, Belinchon I, Banuls J, et al. Skin lesions from the application of suction cups for therapeutic purposes. Actas Dermosifiliogr 2006; 97: 212-4. 3. Cao H, Han M, Li X et al. Clinical research evidence of cupping therapy in China: a systematic literature review. BMC Complementary and Alternative Medicine 2010; 10:70. 4. Sang J, Wang S, Lu X. Needling and cupping used to treat 20 cases of erysipelas. J Tradit Chin Med 2003; 23: 116. 5. Wang W. Moving flash-fire cupping along the channels- a new method for treating urticaria. J Tradt Chin Med 2004; 24: 128. 6. Pan H. Thirty-two cases of acne treated with blood-letting puncture, cupping and Chinese-drug facemask. J Tradt Chin Med 2005; 25: 270-2. 7. Zhang HS, Gao XY. Observation on therapeutic effect of acupuncture, moving cupping and blood-letting puncture on chloasma. Zhongguo Zhen Jiu 2009; 29: 119-21. 8. Yoo SS, Tausk F. Cupping: East meets West. Int J Dermatol 2004; 43: 664-5. 9. Grattan CE, Sabroe RA, Greaves MW. Chronic urticaria. J Am Acad Dermatol 2002; 46: 645-57. 10. Li L, Ding J. Treatment of urticaria with cupping at back-shu points- a report of 40 cases. J Tradit Chin Med 2001; 21: 37-8. 11. Liu D. Pricking, cupping and qu feng tiao ying decoction for treatment of chronic urticaria. J Tradit Chin Med 2002; 22: 269-71. 12. Ding LN. 50 cases of acne treated by puncturing acupoint dazhui in combination with cupping. J Tradit Chin Med 1985; 5: 128. 13. Chen D, Jiang N, Cong X. 47 cases of acne treated by prick-bloodletting plus cupping. J Tradit Chin Med 1993; 13: 185-6. 14. Wang Q. 54 cases of eczema treated with acupuncture, bloodletting and cupping. Shang J Acupunct 2000; 19: 16-7. 15. Jun J. Observation on clinical effect of vitiligo treated with medicinal cupping. Chin Acupunct Moxibustion 1992; 12: 11. 16. Zhao F, Wang P, Hua S. Treatment of psoriasis with acupuncture and cupping therapy. Chin Acupunct Moxibustion 1991; 11: 16-9. 17. Tham LM, Lee HP, Lu C. Cupping: from a biomechanical perspective. J Biomech 2006; 39: 2183-93. 18. Kose AA, Karabagli Y, Cetin C. An unusual cause of burns due to cupping: complication of a folk medicine remedy. Burns 2006: 32: 126-7. 19. Tuncez F, Bagci Y, Kurtipek GS, Erkek E. Suction bullae as a complication of prolonged cupping. Clin Exp Dermatol 2006; 31: 300-1. 20. Sohn IS, Jin ES, Cho JM, et al. Bloodletting-induced cardiomyopathy: reversible cardiac hypertrophy in severe chronic anaemia from long-term bloodletting with cupping. Eur J Echocardiogr 2008; 9: 585-6. 21. Weng YM, Hsiao CT. Acquired hemophilia A associated with therapeutic cupping. Am J Emerg Med 2008; 26: 970. 22. Tada T. Toward the philosophy of CAM: super-system and epimedical sciences. Evid Based Complement Alternat Med 2004; 1: 5-8. 23. Schocket AL. Chronic urticaria: pathophysiology and etiology, or the what and why. Allergy Asthma Proc 2006; 27: 90-5. 24. Przybilla B, Ring J, Volk M. Total IgE levels in the serum in dermatologic disease. Hautarzt 1986; 37: 77-82. 25. Zhou A, Qianru Z, Ting Z. Effect of acupuncture on serum C3 content in the patient of chronic urticaria. Chin Acupunct Moxibustion 2003; 23: 641. 26. Dos Santos JC, Azor MH, Nojima VY, et al. Increased circulating pro-inflammatory cytokines and imbalanced regulatory T-cell cytokines production in chronic idiopathic urticaria. Int Immunopharmacol 2008; 8: 1433-40. 27. Dhar S, Malakar R, Chattopadhyay S, et al. Correlation of the severity of atopic dermatitis with absolute eosinophil counts in peripheral blood and serum IgE levels. Indian J Dermatol Venereol Leprol 2005; 71: 246-9. 28. Aral M, Arican O, Gul M, et al. The relationship between serum levels of total IgE, IL-18, IL-12, IFN-gamma and disease severity in children with atopic dermatitis. Mediators Inflamm 2006; 2006: 1-4. 29. Chiarelli F, Canfora G, Verrotti A, et al. Humoral and cellular immunity in children with active and quiescent atopic dermatitis. Br J Dermatol 1987; 116: 651-60. 30. Kapp A, Neuner P, Krutmann J, et al. Production of IL-2 by mononuclear cells in vitro in patients with atopic dermatitis and psoriasis. Comparison with serum IL-2 receptor levels. Acta Derm Venereol 1991; 71: 403-6. 31. Leeming JP, Ingham E, Cunliffe WJ. The microbial content and complement C3 cleaving capacity of comedones in acne vulgaris. Acta Derm Venereol 1988; 68: 468-73. 32. Thielitz A, Reinhold D, Vetter R, et al. Inhibitors of dipeptidyl peptidase IV and aminopeptidase N target major pathogenetic steps in acne initiation. J Invest Dermatol 2007; 127: 1042-51. 33. Akaza N, Akamatsu H, Kishi M, et al. Effects of Propionibacterium acnes on various mRNA expression levels in normal human epidermal keratinocytes in vitro. J Dermatol 2009; 36: 213-23. 34. Farrokhi S, Hojjat-Farsangi M, Noohpisheh MK, et al. Assessment of the immune system in 55 Iranian patients with vitiligo. J Eur Acad Dermatol Venereol 2005; 19: 706-11. 35. Galadari I. Serum levels of the soluble IL-2 receptor in vitiligo patients in UAE. Eur Ann Allergy Clin Immunol 2005; 37: 109-11. 36. Li LF, Sujan SA, Yang H, Wang WH. Serum immunoglobulins in psoriatic erythroderma. Clin Exp Dermatol 2005; 30: 125-7. 37. Kapp A, Wokalek H, Schopf E. Involvement of complement in psoriasis and atopic dermatitis- measurement of C3a and C5a, C3, C4 and C1 inactivator. Arch Dermatol Res 1985; 277: 359-61. 38. Roussaki-Schulze AV, Kouskoukis C, Petinaki E, et al. Evaluation of cytokine serum levels in patients with plaque-type psoriasis. Int J Clin Pharmacol Res 2005; 25: 169-73.